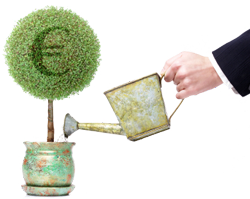 Do you want to nurture new leads, existing leads or both? How do you to segment your audience? Which content is available for nurturing? What frequency of emails and duration of campaign do you prefer? When do you send leads to sales? Do you need to improve the quality of your lead data? Let’s look at each of these questions. New Leads, Existing Leads, or Both? If you’ve never nurtured your leads, you may find sales opportunities in your existing database. This depends on many factors, including the size of your database, the average age of the leads, the lead source, and the length of your sales cycle. If you sell multiple products, cross-selling may work for you. If you expect to find sales opportunities in your existing database, this may be a good place to start. Don’t expect to close 10 deals after the first email: nurturing takes time to deliver results. Once you’ve set up nurturing for existing leads, start with your new leads. These nurture campaigns start when new leads register, while campaigns for existing leads are batch campaigns started by the campaign manager. Once new leads are entered in a nurturing program, make sure they will always be in some kind of nurturing track, unless they unsubscribe. Nurturing is most effective if the messages are relevant for the audience. If a lead registers for a technical whitepaper, send more technical information or invitations for technical events. If someone is interested in product A, don’t send info on product B, unless products A and B are similar or at least complementary. If you market in multiple languages, make sure your emails and marketing materials are also available in the local language. The simplest campaign is linear: leads receive a series of emails spread out over a certain time period. For example, a lead could receive one email per month for 6 months total. If you’ve segmented your database you can assign a lead to the most appropriate campaign. Once the campaign is over, move the leads to the general nurture campaign (e.g. a general newsletter), so they continue to hear from you. This is a simple but effective way to start with email nurturing. If you find that people are often in the wrong segment, or if you want to respond differently to leads based on by their response to your campaign, you want to use dynamic campaigns. This is more complex, because you’re creating dynamic rules for campaigns, and with every rule there is the possibility of errors. However, if you get it right, you’re really responding to lead behavior in real-time. Every campaign needs content. Not just the text in the email that you send out, but especially the offer in the email. The best offers are whitepapers, webinars, ebooks, blog posts, analyst reports, or any other educational resources. In some cases you can send product collateral, but educational materials are usually most effective, because they address an issue that the recipient may have. Unless you are sure that a lead is ready to buy, you wouldn’t use a discount or other price incentive in your campaigns. After you do some digging, you’ll be surprised how much content your organization has access to: sometimes you can even point to 3rd party blog posts. The longer the sales cycle, the longer you want to run a particular campaign. In B2B marketing, campaigns often run 3-12 months. After that, you still want to occasionally send something to prospects: even after years of ‘lurking’ some may suddenly be ready to buy. Shortly after a new lead registers you can send email more frequently, but after that you can slow down to one message every two, three or four weeks. The minimum frequency for emails is once a month. At some point in time you want to hand over leads to the sales team for follow up, both for new as well as “revitalized” existing leads. When you start your campaign you may want to review lead activity manually to find interesting leads to send to sales. Once you see patterns, you can use lead scoring to automatically send leads to sales. When sales is actively talking to a lead, you want to pause the campaign for this lead. However, when the lead is not yet ready to buy, the campaign should resume. The success of the campaign depends on your ability to send relevant content to leads. For new leads, you want to ask enough information so you know what they are interested in. For existing leads, you ideally have enough information in your database to add leads to a relevant campaign. On top of that, you want to avoid duplicates and other errors, because people may receive the same email twice, or with silly personalized fields. To give an example of the latter: sometimes sales people add notes in the name field, such as “Robert (goes by Rob)”. It would be undesirable to send out an email that starts with “Hi Robert (goes by Rob), rest of the email…”. If you have great leads in your database, that’s a good place to start lead nurturing. Start simple, and don’t try to automate everything (you may automate the wrong things). Be creative in finding interesting content, and keep up the nurturing for at least three months. Once you get started you will discover what works and what doesn’t, and you can get more sophisticated as you go along. This entry was posted in Demand Generation, Email Marketing, marketing automation and tagged data quality, drip campaign, lead nurturing on April 15, 2010 by Jep Castelein.